As I look out my window this winter, I notice two properties in nature that are amazing to me: uniformity and symmetry. Some teams could benefit from uniformity among its members regarding their status. Hard skills define each member’s contribution, but what makes the team function are soft skills – so team members invest in their emotional intelligence (“EQ”). If team members have high EQs collectively, where they are attentive to each other’s personalities, skills, and values, the team might function without the direction of a leader per se. A tree on my property has branches reaching out to create an almost perfect half circle. If you think of this tree as a structure, it is impressive. It is about one hundred feet high and the branches spread out to about thirty-five feet wide. And the root structure makes it unwavering. A modern-day professional’s skill set should have symmetry, a well-proportioned combination of transferable and technical skills. Here is a tree analogy… The number of branches represents the breadth of skills, and the length of the branches represents the depth of skills. Stems represent methods and applications of a skill. Leaves represent knowledge. 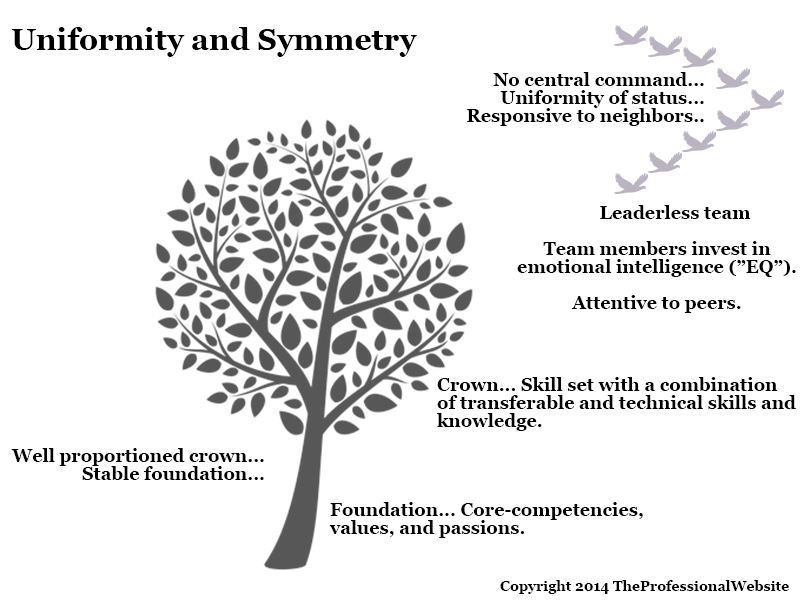 The trunk and root structure represent a professional’s inner self – core-competencies, values, and passions.